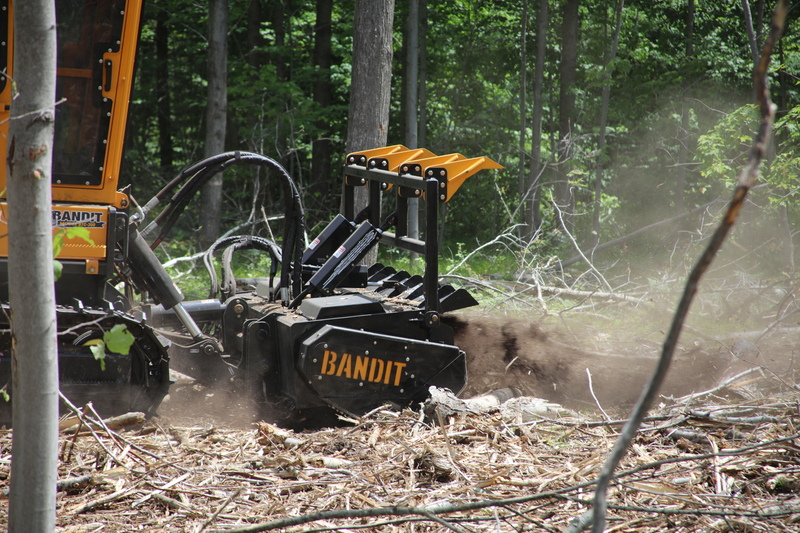 Bandit Industries has improved its lineup of track carriers and forestry mowers on virtually every facet of the previous forestry mower line. The result is a completely new machine designed around the operator first. The BTC-300 and the BTC-150 feature powerful, innovative designs combined with the most luxurious and comfortable cabin. 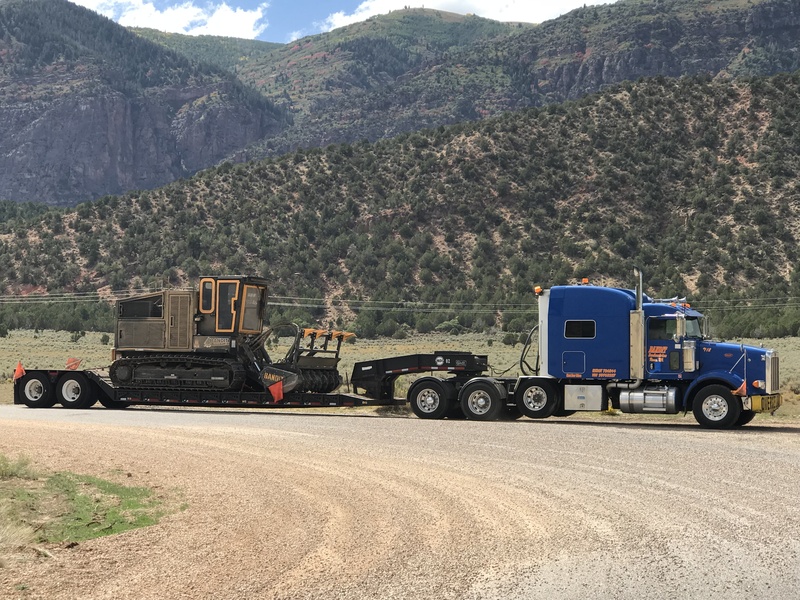 This combination makes both track carriers the new industry standard for the land clearing and right-of-way maintenance industries. The result is the most luxurious and comfortable cabin combined with the most powerful and innovative designs to make the BTC-300 and the BTC-150 the new industry standard for the land clearing and right-of-way maintenance industries. In order to accommodate the shift to new Tier 4 Final engine packages, Bandit redesigned and improved the track carrier line. The new machines are the product of a rigorous improvement campaign to create aggressive, industry-leading machines. The BTC-150 and BTC-300 are both ROPS/FOPS/OPS certified to the highest standard and common maintenance items are positioned to be easy to get to. The BTC-300 was the first new track carrier developed by Bandit Industries to accommodate Tier 4 Final engines from 300 to 321 horsepower. The first thing operators will notice is the inviting operator’s cabin. Starting with a deluxe captain chair, the seat is four-way stretch, breathable fabric that rides on a fully adjustable spring loaded suspension. All functions of the BTC-300 are controlled from two joysticks located on the adjustable armrests. This keeps the operator’s arms in a comfortable position. The view has also been improved. Ballistics-grade 1 ¼” thick polycarbonate glass protects the operator while providing an unobstructed view of the working area. And a backup camera and display screen make it easy to see behind the BTC-300 while backing up. The sound-insulated cab is mounted on rubber isolators to provide a smoother ride while absorbing the vibration of the machine while it’s working. And powerful heating and cooling systems will keep the operator comfortable any time of year. Because the cab of the BTC-300 can be your office for the day, it features convenience items such as a padded cell phone holder, a 12-volt charging port and dual oversized cup holders. But the cab wasn’t the only area that got attention from Bandit engineers. The Caterpillar 315 steel track undercarriage was widened to offer greater traction and flotation, while still keeping the machine thin about to slip between trees in thick forests. The body was redesigned to remove many of the squared off, bulky sections of the previous generation of forestry mowers, resulting in a sleeker look. 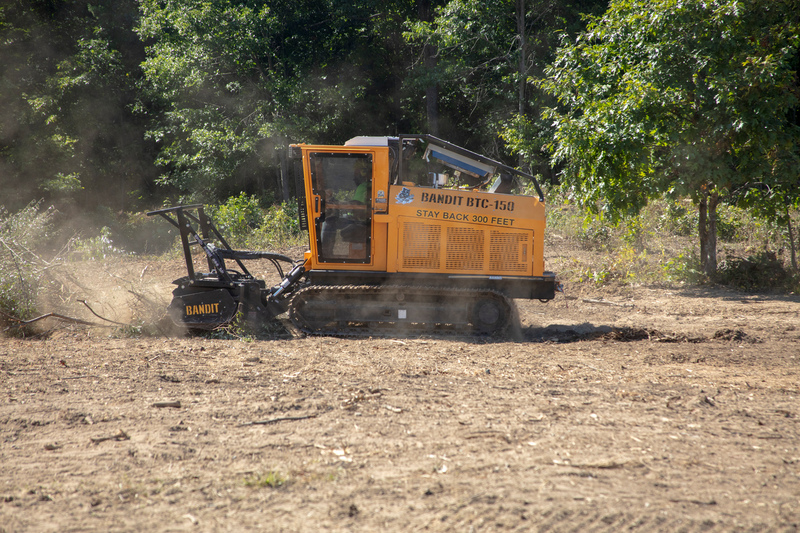 Whether clearing acres of trees or fields of stumps, the BTC-300 can handle it with newly designed mowing and stump grinding attachments. The forestry mower features a very wide 90-inch cut and can easily take down small-to-medium sized trees. A new float feature helps the mower head ride at ground level without digging in. A new patent-pending tooth and holder design aggressively processes trees, limbs and brush, mulching it all directly into the ground. The stump grinding head features a 44-inch diameter grinding wheel with a deeper reach, and it offers 30% more torque than previous models for quick efficient grinding. Switching between the attachments is extremely easy, taking less than 10 minutes in the field. And Bandit’s patented mulcher head teeth setup is easy to change, needing only one bolt on the back side of the tooth so it’s never subject to wear. The BTC-150 is just as comfortable as the larger machine and includes many of the same great features in its compact frame. Its comfortable operator cab features a spring suspension adjustable seat, with joystick armrests. The 1 ¼” glass protects the operator while proving a great view of the work zone, and all maintenance items are within easy reach. 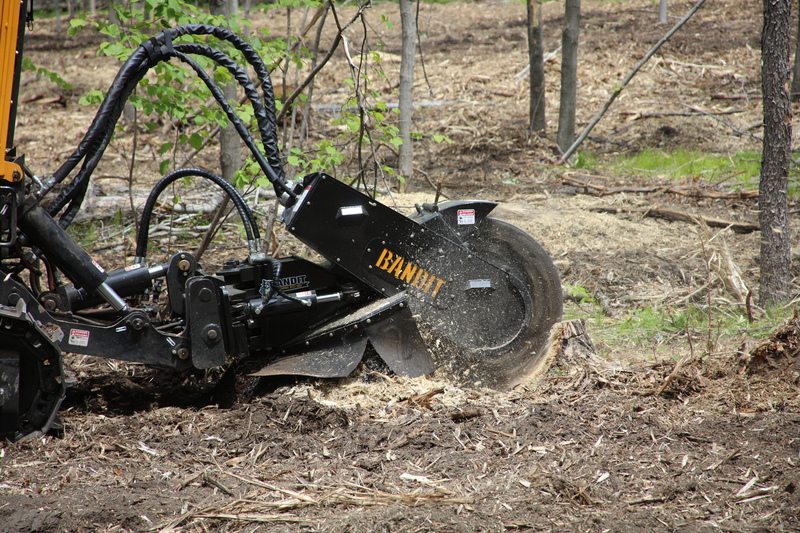 The BTC-150 features a 72” mower head attachment or a 30” diameter cutterwheel. And the heads are easy to change, taking less than 10 minutes in the field. Featuring Bandit’s unique mower head design that directs material to the center of the rotating shaft, helping break up material as it mows. And the BTC-150 features proven Caterpillar 308 tracks, available as steel, triple grouser tracks, rubber or a segmented track, with incredible turnability. And the unit is powered by a Caterpillar 148 horsepower Tier 4 Final engine.